The name Mississippi is derived from the Algonquin Indian term Mes-cheseepik which means “big water,” so it is no surprise that the river bearing this name is the largest in the United States. This same Algonquin term was used in naming another large body of water in the United States – the Chesapeake Bay. After winding its way south through America’s heartland, the Mississippi River separates into many channels before reaching the Gulf of Mexico. 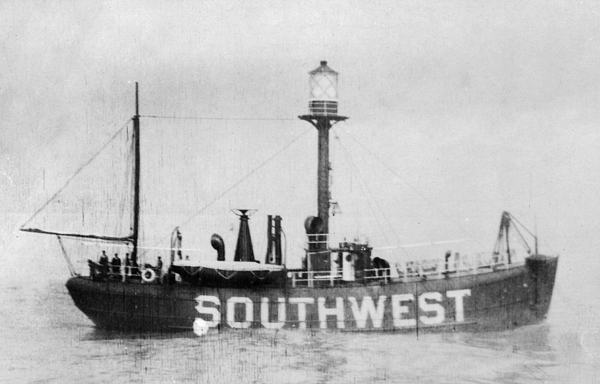 Today, the primary shipping channel is Southwest Pass, but South Pass and Northwest Pass were also marked with lighthouses and used by many mariners through the years. Like South Pass to the east, Southwest Pass has been served by multiple lighthouses, and its first tower was also built by Winslow Lewis. Lewis’ sixty-five-foot conical brick tower at Southwest Pass was put into service on April 18, 1832, after having been erected on a foundation of driven piles. Two unique features helped mariners identify this lighthouse: a daymark consisting of vertical black stripes, and three windows built into the seaward side of the tower below the lantern room from which additional lights were exhibited. Unfortunately, the lower lamps were not properly ventilated, and the soot rose in the tower, blackening the glass planes in the lantern room and adding to the keeper’s workload. 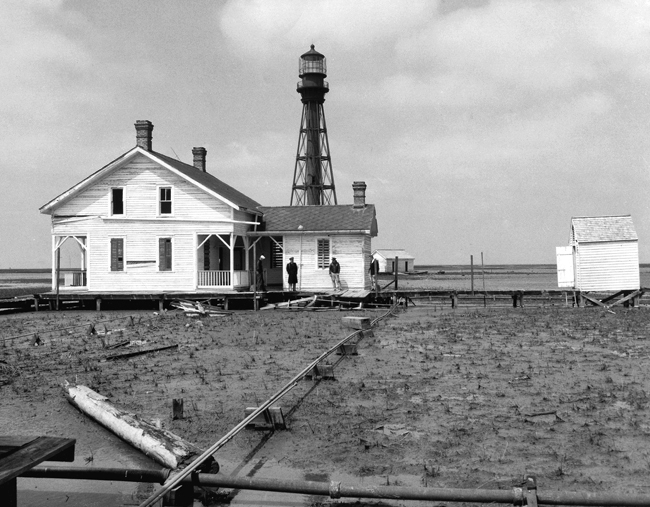 During its first year of service, Southwest Pass lighthouse was threatened by erosion. Measures to retard the encroachment of the river failed, and by April 1837, the tower stood in ten feet of water. Later that year, the tower toppled over and disappeared. This didn’t prevent a dutiful and resourceful keeper from exhibiting a light. A lantern was soon mounted from a tall pole, and the keeper continued his service, having only a small, squat hut for shelter. On July 7, 1838, Congress allocated $20,000 for a replacement tower. 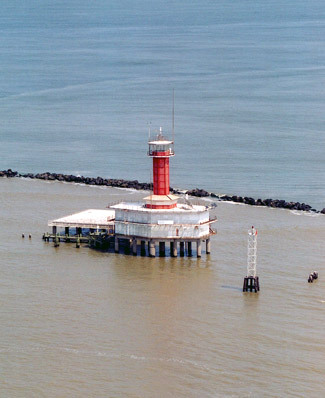 The new tower inherited the same vertical markings of its predecessor, and was outfitted with two bay windows, which protruded from the gulf side of the tower, twenty-five feet below the lantern room. The windows held additional lamps, and as a mariner approached from the gulf aligned with the proper channel, the lights from the lantern room and the two bay windows formed a triangle. Contractors from Massachusetts were selected to erect this second tower, and to oversee the work, the Treasury Department appointed Isaiah W.P. Lewis, nephew of Winslow Lewis. I.W.P. harassed the contractors and forced modifications to the foundation, which resulted in the tower becoming unstable after reaching a height of just twenty feet. 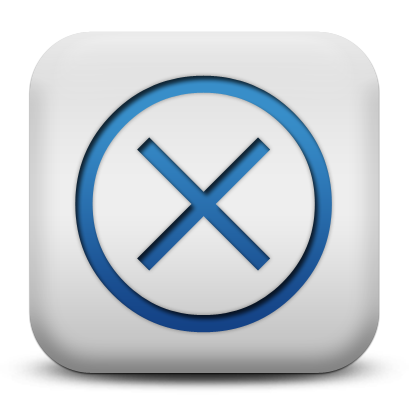 I.W.P. was promptly removed from the site, and the contractors began anew on the tower, following a design by Winslow Lewis. Not long after the tower was completed, one of its sides settled into the spongy land, leaving the tower five feet out of plumb. By 1850, the leaning tower was standing in a foot of water, and the Lighthouse Board was motivated to start planning for yet another tower at Southwest Pass, which it estimated would cost $115,000. When Northeast Pass Lighthouse was discontinued at the beginning of 1857, the two “wing lights” on Southwest Pass Lighthouse were also discontinued as they were no longer required for distinguishing the two lighthouses. 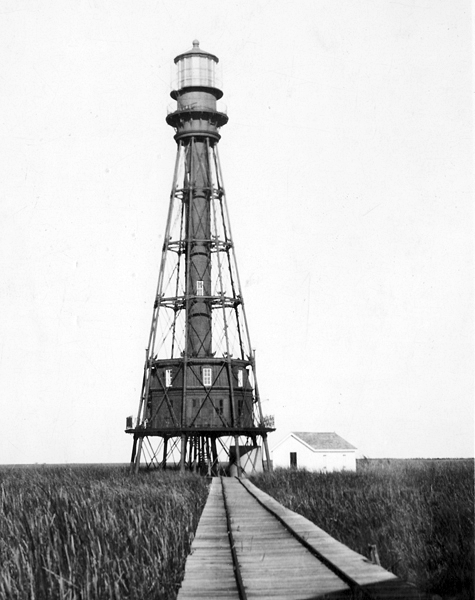 Congress appropriated $45,000 on August 3, 1854 for an iron screwpile lighthouse for Southwest Pass “to be fitted with the most approved description of illuminating apparatus and fog-signals,” but before the remaining amount was provided, the original appropriation reverted to the treasury. In March 1859, Congress allocated $108,600 for the project. Work began on site selection and plans for the new lighthouse, but before much progress was made, the Civil War erupted. In 1861, Keeper Manuel Moreno complained that both the tower and dwelling were flooded, and that flotsam was jeopardizing the structures. Informed of the ongoing Civil War by reports from river traffic, Moreno was also concerned for his own well-being. He pleaded for weapons to defend himself, and when the Union blockade was established at the delta, Moreno, loyal to the South, shielded the light so it could only be seen from upstream. 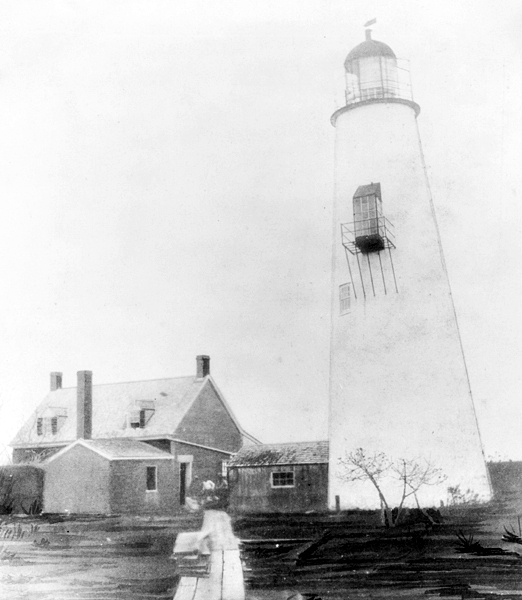 On the morning of July 5, 1861, armed Union forces landed at the station and removed the lens from the lighthouse. Moreno was left without a light, and was soon without a job, as all keepers in the area were discharged. After the delta region was secured by the Union, the tower was activated again in 1862. Following the war, the Lighthouse Board renewed its petition for funds to replace the tower at Southwest Pass, and Congress reappropriated $108,600 for the lighthouse on March 2, 1867. To this amount was added $41,000 in 1870 and $25,000 in 1872, making the total cost for the lighthouse a staggering $174,600. Rather than construct a third brick tower at the pass, the new design called for a skeletal, metal tower. The spindly structure would be lighter in weight and disperse that weight over a wider foundation, hopefully allowing the tower to overcome the problems that plagued the previous towers. At 6 feet below the tops of the piles, which are 1 foot below low water, a horizontal course of 12 inch square timbers are notched into the piles. Below the timbers a mass of shell concrete 2 feet thick is rammed about the piles, and on the timbers rests a floor of 3-inch plank. Above the flooring are a second and third course of timbers notched into the piles, and laid at right angles with each other, and diagonally to the first course. A mass of concrete is forced into the interstices of the timbers, and filled up to a height of 4 feet above the third tier, bringing the top of the foundation to about 18 inches above mean level of the water. An octagonal iron tower, which was constructed under contract in Ohio, arrived on site in December 1872 and was erected during the following months. The tower’s central cylindrical spine was surrounded by a two-story dwelling at the base and eight lengthy supporting columns tied together with a web of iron rods. Atop the tower were a watch room and a lantern room, the latter of which was filled by a first-order Fresnel lens. The new fixed white light, which was shown from a focal plane of 128 feet, was first activated on July 1, 1873. Before the arrival of the tower, a structure was built to house a twelve-inch steam whistle. This navigational was placed in service in 1872 but was discontinued in 1880 and placed in storage at the depot at South Pass. On May 22, 1894, a conflagration erupted in the dwelling portion of the tower. When the fire reached the central cylinder, a rising column of air fanned the flames, intensifying the heat and causing significant damage to the central iron column. After a new lantern was obtained from South Pass, new plate glass was supplied, and temporary quarters were built for the keepers, the light returned to service on June 15, 1894. A contract for furnishing and delivering metalwork to repair the tower and dwelling was not made until 1898. The following year, the repair work consisted of rebuilding the central cylinder from the lantern down, building a temporary keepers’ dwelling, and placing new iron stairs in the cylinder leading up to the lantern room. On June 30, 1906, Congress appropriated $12,000 for building three frame keeper’s dwellings in the marsh near the tower. The residences were completed in early 1909. 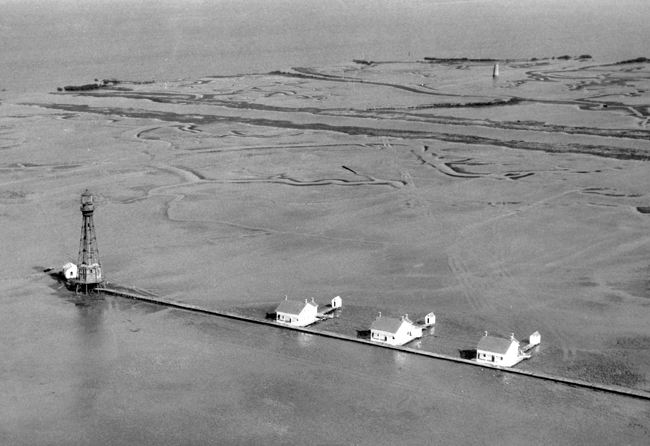 In 1929, a fog signal and radiobeacon station was built near the end of the east jetty, which had been constructed several years earlier at the entrance to Southwest Pass. Funds for the station were requested as early as 1910, but the needed money was not provided until 1928. 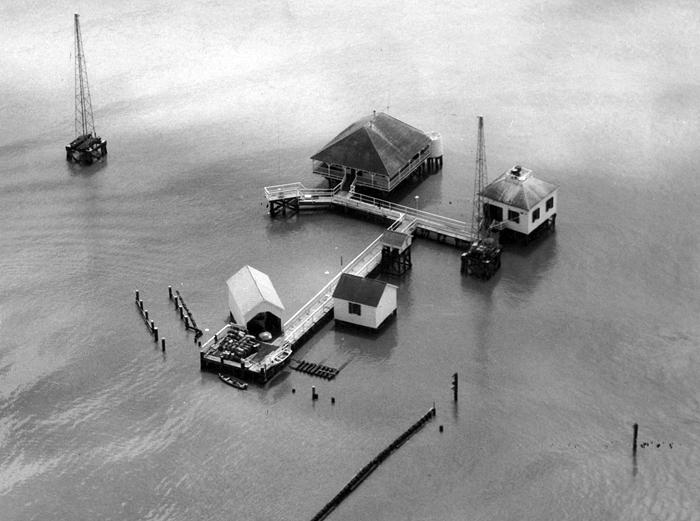 The station consisted of a twenty-six-foot-square fog signal house, set on twenty-five piles, a six-room dwelling for four keepers, set on twenty piles, two sixty-six-foot galvanized steel radio towers, a storehouse on six piles, and a boathouse on eight piles. Two hundred and sixteen feet of elevated walk linked the various structures together, and electricity, produced by generators, was used to power the station. 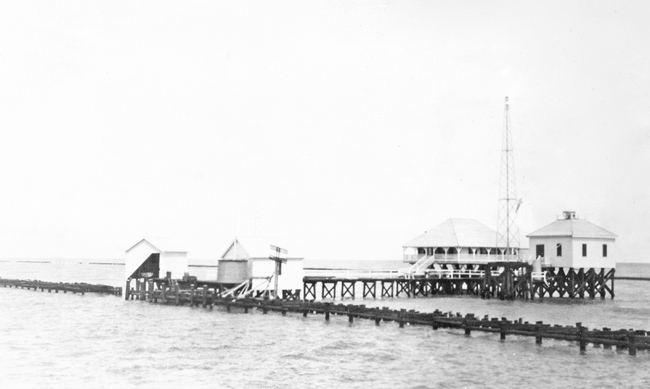 A quarter-mile-long submarine cable was laid from the station in 1930 to provide electricity to a light that had been established several years earlier on the end of the east jetty. The automatic fog bell that was a companion to the light was replaced at this time by an electric siren. 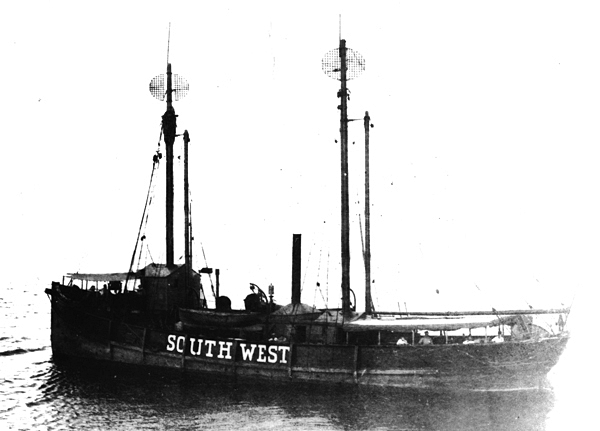 While funds were being awaited for a station to mark the east jetty, a lightship was anchored off the entrance of Southwest Pass to server mariners. Lightship LV-43 served at the station from 1912 to 1917, and LV-102 served from 1917 until the station was discontinued in 1918. 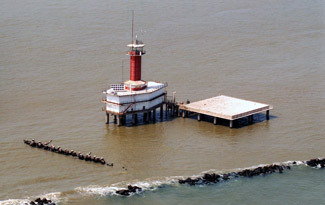 The east jetty light was upgraded to serve as the primary entrance light for Southwest Pass in 1953. 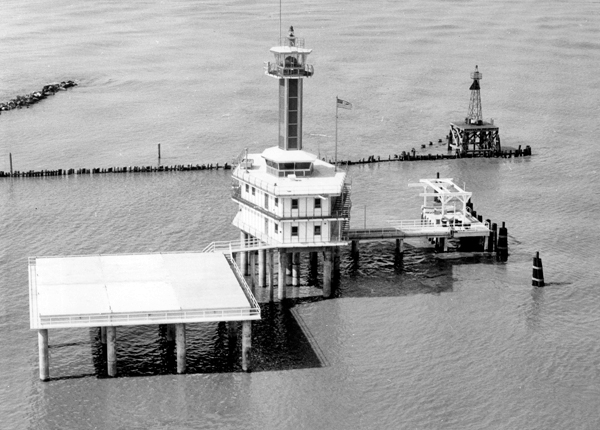 It performed this function until 1965, when a modern tower, consisting of a six-sided, two-story building, with a smaller but similarly shaped tower projecting upward from its center, was built in the waters just off the jetties. 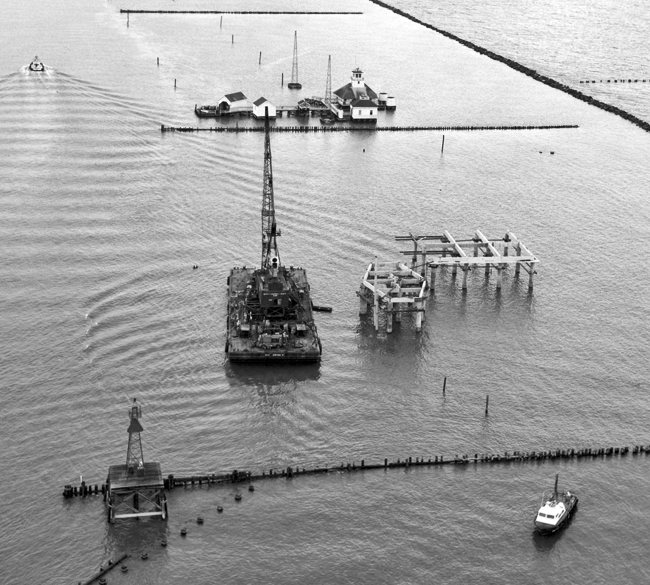 This superstructure, along with a boat dock and a helicopter landing pad, rested on a lattice of concrete pilings anchored in the floor of the gulf. 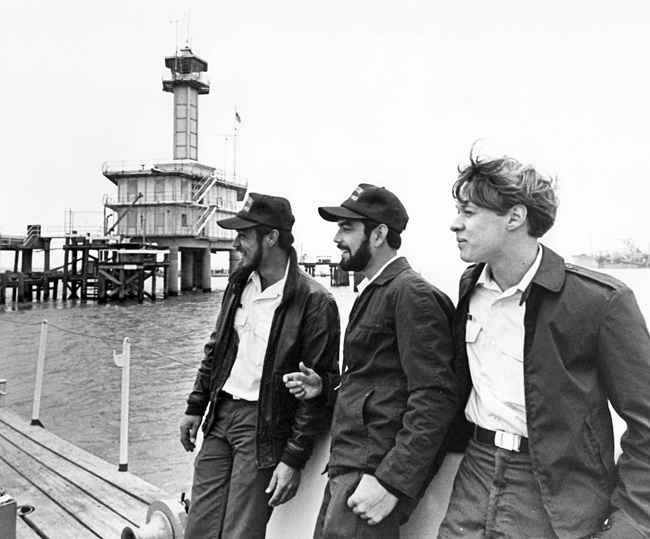 The last crew was removed from the 1965 Southwest Pass East Jetty Station in 1984. 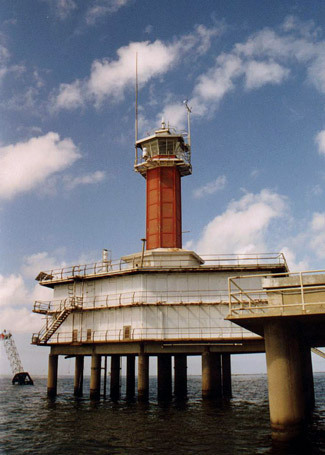 In 2007, two years after Hurricane Katrina, the Coast Guard demolished this station and replaced it with a skeletal, metal tower mounted atop a platform supported by three steel piles. Today, three of the numerous lights that have served Southwest Pass remain standing. Ships can readily see the evolution of lighthouse construction as they pass the stub of a brick tower, an iron skeleton tower, and a modern three-legged tower all found near the entrance to Southwest Pass. Second Assistant: Samuel F. Draim (1936 – 1937), Joseph Brown (1937 – 1938), Earl A. Marshall (1938), Carl W. Kohn (1938 – 1939). Third Assistant: George H. Bardwell (1933 – 1935). Lighthouses, Lightships, and the Gulf of Mexico, David Cipra, 1997. 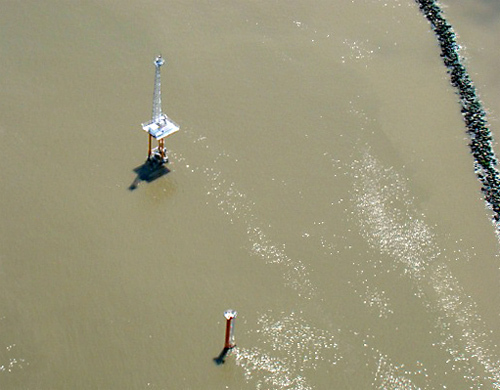 Located in the Mississippi River Delta, at the entrance to Southwest Pass from the Gulf of Mexico. 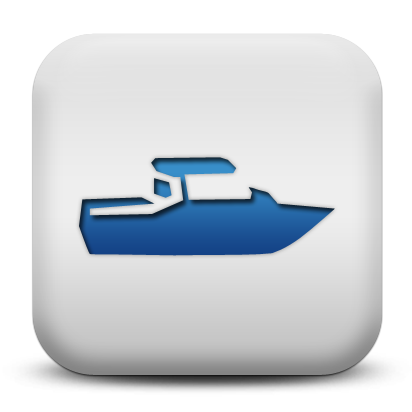 For a larger map of Southwest Pass Entrance Lighthouse, click the lighthouse in the above map. Southwest Pass Entrance Lighthouse is best seen by boat or plane. Aerial tours of the New Orleans area, which can include multiple lighthouses, are available through Southern Seaplane.